...are my new favorite food! 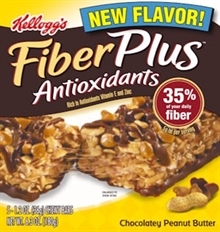 At 3P+ a bar and containing 35% of DRV of fiber, it's a delicious and guilt free snack. The only draw back is the price. $3 for 6 bars... which means if you were to eat 3 of them a day to get all your fiber, it would end up costing you about $45 for the month. Even if you eat 2 a day, that's still $30. I had 2 of these yesterday, in addition to my spinach and green pepper. Let me tell you what- I was full all day. I had 2 of them for breakfast today too. At 3P+ each, why *wouldn't* you? It's a great tasting way to get some fiber. I wish I could eat these for free, for the rest of my life. :) Have a good day, friends! Those look delicious! I don't know if I could control myself around them haha! I had the Oats and Chocolate ones last week. I felt almost sinful!